I don’t like using the words handicapped or disabled when it comes to those who are either born with or develop physical limitations. I prefer to use the word challenged. I believe that people who are challenged are also specially gifted, because they are often compensated with a Herculean inner strength and willpower to override their challenges. They are furthermore our greatest teachers, showing us that just because we might be physically challenged, doesn’t mean we can’t contribute greatly to the world through that challenge. And one of the most amazing teachers and contributors I know was Helen Keller. I remember first discovering about her when I was a young teen, while viewing the movie, The Miracle Worker. I sat and watched the film in total bewilderment, wondering what it would be like to not have my senses of sight and hearing, or the ability to speak. For me, I thought it would feel as though I was trapped inside my body; almost suffocating. Yet as the story progressed, I saw how Annie Sullivan slowly taught Helen how to communicate by using signs and letters on her hand through the sense of touch. Later, Helen learned how to speak by imitating the vibrations and motions she felt in the throat, mouth, and nose of another teacher, Sarah Fuller, at the Horace Mann School for the Deaf. 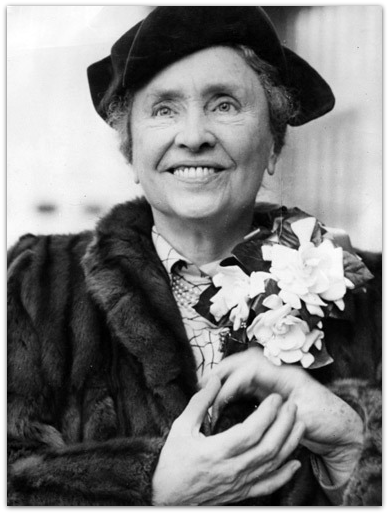 And what astounded me about Helen Keller was that she went on to earn a Bachelor of Arts degree and became a world-famous speaker, political activist, and author. She wrote a total of 12 published books. She led a very rich, full and happy life, in spite of her challenges. And from what I've read, she also had a great sense of humor; enjoying a good joke. Yes, Helen Keller may have been blind and deaf, but she had a keen inner vision and sense of hearing which she channeled through her heart; spending her entire life paving the way for others to have hope, and to learn. She embraced her challenge; making it a vocation. Whenever I think I can't, I think of Helen. And know that I can. Thank you, dear lady. And know that you will never be forgotten. Good morning Ron. 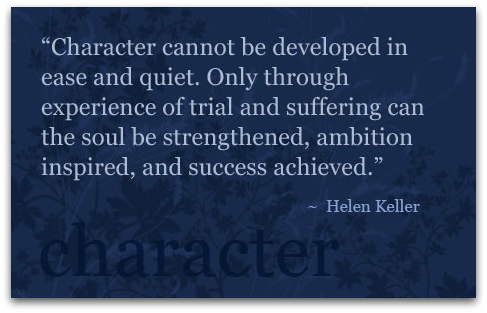 Helen Keller was indeed an amazing person to overcome her difficulties the way she did. I love her story and thank you for sharing it.... and reminding me it's time I changed my ways and be thankful for my blessings. 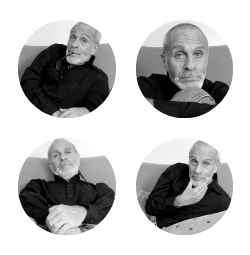 It looks like our thinking is controlled by some superior being since only yesterday I decided to do a post on a very popular and clever deaf person. Not as yet written but I'm working on it. Our last clash of thoughts resulted in this http://tinyurl.com/l53t9x5 if you have time to glance at it. Hoping your weather is good and that you have a brilliant week. I remember watching that film with tears streaming down my face. Helen Keller was such an inspiration and so was her teacher, Annie Sullivan. I love the quotes you found Ron. I, too, loved learning about her when I was young. There seems to be a period around fourth or fifth grade where you learn about famous Americans like Helen Keller and Clara Barton, but Keller always stood out to me. What an inspiration! I really like the last quote. A friend of ours lost her son at age 19. He had CP and never walked and she and her family were actually comforting the rest of us at his funeral by saying he's finally running now. God, Ron, what a beautiful post! 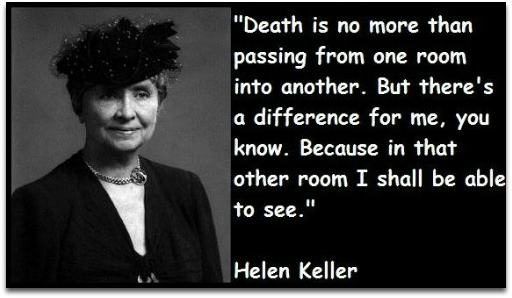 Between your keen observations and Helen Keller's beautiful quotes I'm close to tears. I'm a chronic complainer and ready about someone who had all these problems but managed to live such a full life really touches my heart. "Life is either a daring adventure or nothing." --that's so true and it reminds me that I play it safe much too often. "Whenever I think I can't, I think of Helen. And know that I can." Well, thanks to you, Ron, I'm going to think of Helen, too, when I'm faced with a tough problem. Great post, buddy. Thanks so much for sharing and do take care. I adore the quotes--and I have to stand humbled by what she accomplished in her lifetime, in her own life and in the lives of others. I remember the movie--and I remember being wowed by the performance and the passion of the teacher and the student. People who chase their passions and live in them, thrive. They just do. Maybe that's the 'gift' of it, eh? I struggle with any word used to separate and 'define' a human being. We're all challenged in many way....some rise above and refuse to let those challenges define them. THOSE are the ones I wanna rub elbows with! That energy just rolls off of 'em, yaknow? ron, i can't imagine not having my senses either. 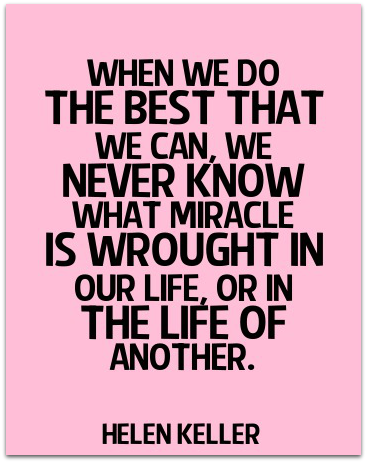 i saw the miracle worker believe it or not and it's so difficult to teach someone who can't hear or speak how to communicate but it has been done and is being done. members of my family are fluent in ASL so i'm around deaf people and know a little sign language myself. it is a beautiful language to me and interesting to watch. "I believe that people who are challenged are also specially gifted,"
Lovely post Ron. I also remember my awe at hearing her story as a child. I think kids are more empathic when it comes to tales of the bravery of their peers. Great post, Ron. I also think that Annie Sullivan needs to be acknowledged for her very important roll in Helen Keller's life. I agree that people seem to achieve so much more when they are physically challenged. Beautiful tribute, Ron! Like you, I remember watching the movie and couldn't comprehend what it would be like to not have my sense of sight or hearing. You described it so perfectly, like being trapped inside my body. And to realize how far she went in spite of her immense challenges, is truly amazing! Loved the quotes you shared. 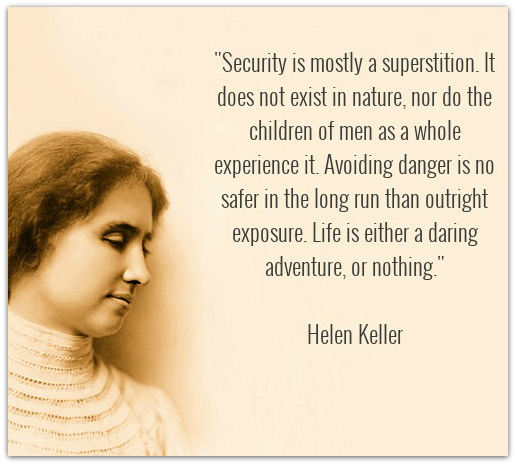 The one that stood out the most for me was the one about security being a superstition. How true! Thank you for sharing this inspiring post, Ron. Have a wonderful week! Last week when you shared a quote from Helen Keller on one of your posts, it immediately inspired me to share this tribute to her her. So thank YOU! ". If we all could accomplish a tiny little bit of what she did in her life...amazing!" Amen! Even just a tiny little bit. Thank you for stopping by, dear lady. Happy Monday to you too! ".... and reminding me it's time I changed my ways and be thankful for my blessings." And me as well. I am mostly aware of how truly blessed I am, however, there are times when I am not. And it's amazing how when I refocus my attention on what I DO have, instead of what I DON'T or WISH to have, I remember just how blessed and wealthy I am - as is. "It looks like our thinking is controlled by some superior being since only yesterday I decided to do a post on a very popular and clever deaf person." HA! Isn't it something how often you and I are on the same page of thought??? And thank you for sharing the link your post. I must have missed it when I had no Internet service. I just briefly glanced at it, but when I have more time today, I will read it in FULL. Can't wait. Thanks for stopping by, dear lady. Have a brilliant week as well! "Helen Keller was such an inspiration and so was her teacher, Annie Sullivan." Yes, and so was Annie Sullivan! Amazing and inspiring as well. She was actually partially blind and then was totally blind later in her life. Thanks so much for stopping by, m'dear. Looking forward to hearing all about your trip! Have a lovely week! "There seems to be a period around fourth or fifth grade where you learn about famous Americans like Helen Keller and Clara Barton, but Keller always stood out to me." Yes, you're absolutely right, that was the period when we learned about famous Americans. And like you, Helen Keller really stood out to me. I have always been interested in those who are physically challenged; admiring them so. And like you, the last quote really touched me as well. In fact, when I first read it, I cried.
" He had CP and never walked and she and her family were actually comforting the rest of us at his funeral by saying he's finally running now." OMG...how touching. Yup, I'm crying again. Thanks so much for stopping by, my friend. Have a beautiful week! 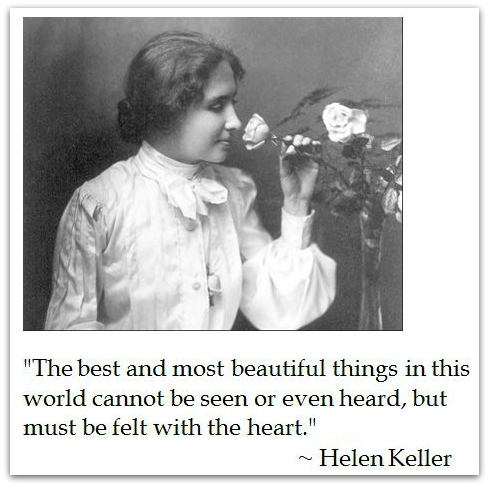 I have always wanted to share a tribute to Helen Keller on my blog. So when I read one of her quotes on one of my blogging friends blog (Jeanne) last week, it suddenly sparked me to do it. ""Life is either a daring adventure or nothing." --that's so true and it reminds me that I play it safe much too often." Isn't it something how we ALL have the desire to avoid adventure (danger/challenges); playing it safe? Yet, we really can't. And then when we look back on those challenges we see that they were some of the best times in our lives because of what we learned and how we grew from them. Thanks so much for stopping by, buddy. Have SUPER week! Aren't Helen's quotes so inspirational? There were so many great ones online to choose from, that I finally had to narrow it down to these seven. "and I have to stand humbled by what she accomplished in her lifetime, in her own life and in the lives of others." "People who chase their passions and live in them, thrive. They just do. Maybe that's the 'gift' of it, eh?" It's as if she KNEW that this was her vocation in life. So she took it and made the best of it. I've watched several documentaries on Helen Keller and what blew me away was how HAPPY she always looked. She always had a smile on her face that came from WITHIN. ".some rise above and refuse to let those challenges define them. THOSE are the ones I wanna rub elbows with! That energy just rolls off of 'em, yaknow?" Thanks for stopping by, dear lady. Have a wonderful week! "and it's so difficult to teach someone who can't hear or speak how to communicate but it has been done and is being done." And Annie Sullivan, her teacher, had so much to do with that. She herself was partially blind at the time and then later in life became totally blind. She was truly an amazing and inspiring woman as well. And so young at the time - only 20 years old.
" and know a little sign language myself. it is a beautiful language to me and interesting to watch." I agree with you. SUCH a beautiful language to me and something I've always wanted to learn. Thanks for stopping by, girl. Have a terrific week!
" I think kids are more empathic when it comes to tales of the bravery of their peers." Yes, you have a point there! They seemed to be more open and sensitive. Thanks for stopping by, buddy! Have a most excellent week!
" I also think that Annie Sullivan needs to be acknowledged for her very important roll in Helen Keller's life." You are absolutely right!!!! Because if it were not for Annie's perseverance and strength, Helen wouldn't have learned how to communicate. And to think that Annie (at that time) was merely a child herself (20 years) and was also partially blind is AMAZING. Thanks so much for stopping by, my friend. Have a lovely week! "And to realize how far she went in spite of her immense challenges, is truly amazing!" The more I investigated the many things Helen accomplished in her lifetime, the more amazed I became. And after watching several documentaries on her it was even more amazing to see just how upbeat and humorous she was as well. Thanks so much for stopping by, girl. Have fantabulous week! Wow Ron, what a beautiful post and tribute to such an amazing woman! And I have say that it brought a tear to my eyes, dude. And to think what she accomplished with the challenges she was given is truly remarkable. She certainly did paved the way for others to have hope, and to learn. And not only for those who are challenged as she was, but for challenges of all kinds. Inspiring quotes, Ron. Thank you for sharing! The Miracle Worker is how I heard about her to. She was a brilliant and inspiring woman. There was a character in Nip/Tuck who referred to the handicapped as "handi-capable." Corny, but I always thought that was a classy way of looking at disabilities. From a show that was anything but classy, ironically. Helen Keller was a great role model for many! "There was a character in Nip/Tuck who referred to the handicapped as "handi-capable." Thanks so much for stopping by, buddy, and for adding that to this post. Have a super week!
" She was a brilliant and inspiring woman." "And not only for those who are challenged as she was, but for challenges of all kinds." Ditto! And that's what I mean in saying...Whenever I think I can't, I think of Helen. And know that I can." Thanks a bunch for stopping by, bud. Have a fantabulous week! She was indeed a remarkable woman. And her teachers were also pretty remarkable women, because they never, ever gave up hope. I love the set of quotes here - you couldn't ask for a better role model, could you? Hey there Secret Agent Woman! "And her teachers were also pretty remarkable women, because they never, ever gave up hope." You're right. 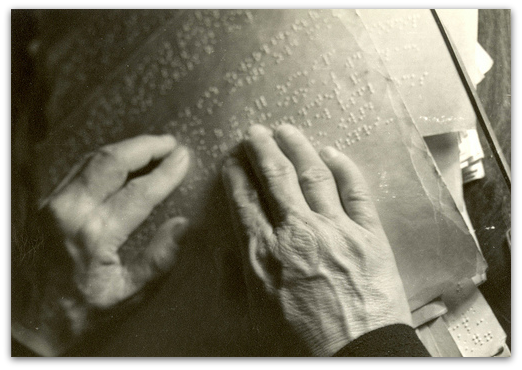 And when you think back then (to the late 1800s') that these two teachers were the direct result of what we now know about teaching the blind and deaf. They were the crusaders! "...you couldn't ask for a better role model, could you?" Much thanks for stopping by, Have a faaaaabulous week! Aww that is a very inspiring post to start of the week right Ronnie! I love the quote "I am only one but still I am one..." All of these quotes are good reminders to keep going and remember that we are not alone in our struggles and we can keep going to get through them. I think its amazing that you took a moment to highlight such a wonderful and often forgotten woman. "I love the quote "I am only one but still I am one..."
Yes, isn't that an awesome quote, Shae? They're so many to choose from online, I had a hard time narrowing it down to these.
" are good reminders to keep going and remember that we are not alone in our struggles and we can keep going to get through them." And that's what I most admired about Helen Keller, she was a beacon of hope, inspiration and strength to not just those with physical challenges, but to ALL of us. Because in one way or another, we are all challenged. Thanks so much for stopping by, girl. Have a beautiful week! Thanks, Ron, for pointing out to us what should be obvious -- we don't all get here with the same challenges or opportunities, but we CAN and SHOULD do our best with the hand we've been dealt! You know, I think Helen's story proves how important it is for humans to communicate. Whether that's via speech or art or music or writing or whatever, we feel a need to express ourselves, and to have others understand what we mean. 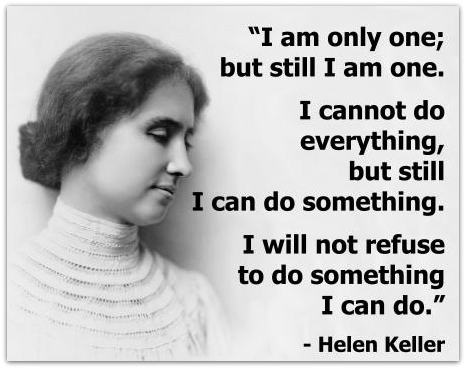 How inspirational to think that, even as a young girl, Helen worked so hard to make herself heard! Thank you for a lovely post, and have a great week! "I think Helen's story proves how important it is for humans to communicate. Whether that's via speech or art or music or writing or whatever, we feel a need to express ourselves, and to have others understand what we mean." Awesome point you brought up because you're right, communication comes in MANY forms; not only through speech and words. I mean look at the Mexican artist, Frida Kahlo, who used her art as a means to express all the pain she felt through her accident. Her art was actually her means of sharing not only how she felt physically, but also emotionally. "...even as a young girl, Helen worked so hard to make herself heard!" She had a very determined and strong will, which was a good thing, because it propelled her forward. And I love that she had a very positive attitude. Thanks so much for stopping by, dear lady. Have a most excellent week! Beautifully written and presented tribute, Ron. Is that first photo an image of Helen Kellers hands? What a touching photograph. I didn't watch the movie until after I read the book for a high school English class. Both the book and the movie were wonderful. Patty Duke and Anne Bancroft were amazing. I know that it was also a play and don't know how anyone could perform that night after night. It had to have been exhausting, both physically and emotionally. Love the quotes and also that last photo of her. Isn't it ironic that even though she was without sight, you can see her beautiful spirit shining through her EYES! Yes, that photo is an image of Helen's hands. I found it online. Isn't it so touching? You can actually FEEL her through that photo!
" I know that it was also a play and don't know how anyone could perform that night after night. It had to have been exhausting, both physically and emotionally." Interesting that you brought that up because I've thought the same thing. Both Anne Bancroft and Patty Duke portrayed the roles on Broadway in the play. And they did for TWO years! I don't know how they did it night after night. "Isn't it ironic that even though she was without sight, you can see her beautiful spirit shining through her EYES!" LOVED THAT! And you're so right...you CAN see her spiriting shining through her eyes! Thanks so much for stopping by, buddy. Hope you had great Monday. Have a maaaaaavelous week! Excellent write-up! 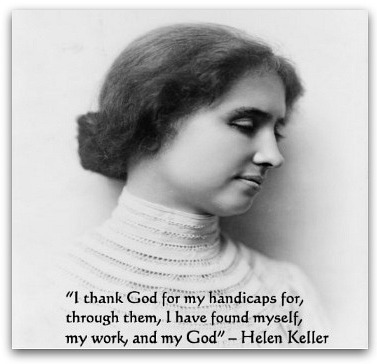 Helen Keller is a great example of the human spirit triumphing over incredible odds. was very fond,--I had a delicious taste on my tongue (which, by the way, I never have now), and in my hand I felt the turning of the freezer. I made the sign, and my mother knew I wanted ice-cream. I "thought" and desired in my fingers." "
Okay, your comment blew me away because you gave me even MORE to ponder and reflect on about this amazing woman! "Now, imagine a woman who possesses less than the processing power of a cat, or a bird, or a lion. How does she survive?" Yes, this is what I mean. I can't IMAGINE what it must have been like to be her (especially before she met Annie Sullivan) and how she felt inside or knew how to communicate her wants or needs. Even basic things such as water and food.
" I was carried along to objects and acts by a certain blind natural impetus." Yes, that's what it had to have been...a natural impetus. I can't thank enough for sharing what you did in your comment, buddy. I have read several books and watched documentaries on Helen Keller, but never read the book you speak of. I will have to get it now, for sure! Thanks for stopping by and have a SUPER-DUPER week! Beautiful tribute, Ron! It's so sad how we put limitations on what we think we can accomplish and we don't even have these kinds of challenges. She's such an inspiration. Love the movie! Well done, my friend.
" It's so sad how we put limitations on what we think we can accomplish and we don't even have these kinds of challenges." It sure is. And I do it as well. This is why I will often think of her whenever I think I CAN'T do something or put limitations on myself. I mean if she could it with the challenges she had, so can I/we. Wasn't the movie wonderful? I would have loved to see Bancroft and Duke perform it onstage...LIVE! Thanks so much for stopping by, girl. Have a faaaaaaaabulous week! Ron, I stopped by to read through the comments and saw the one Herman left. Wow! Really made me think and feel. Yes, I thought the SAME THING, Robert!!!! Sorry that I missed you on Monday. I have had a busy week so far! This is a tremendous post about one of the most inspiring women in History. 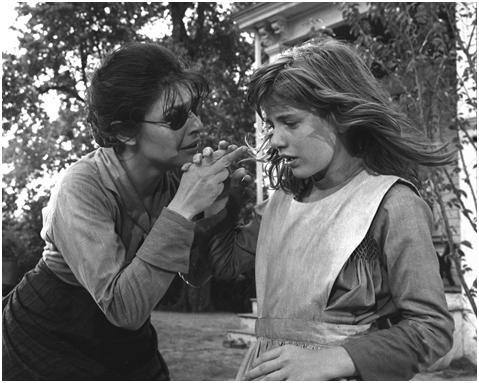 "The Miracle worker" is such a powerful film. I remember that. We know that a person is empowered. It does not have to be someone of international standing. Most often,it can be a person you know everyday who inspires so simply and depply. They may be battling an illness, a single Mom, a person who is in a wheelchair or just each . It is someone who brings out the best in his/her self and often shares the good,the love and the simple wisdom of it all. I absolutely adore Helen's quotes. She was simple and profound all at once.
" They may be battling an illness, a single Mom, a person who is in a wheelchair or just each of us battling our own fears and limitations". "It is someone who brings out the best in his/her self and often shares the good,the love and the simple wisdom of it all." Interestingly, I'm coming here to read this today when I really need the message. I'm struggling with a couple 'educational' pursuits and was just thinking that I'll NEVER get it and it's just too much for me.
" I'm struggling with a couple 'educational' pursuits and was just thinking that I'll NEVER get it and it's just too much for me. Well, I just have to keep going... don't I? :)"
Yes, I think we ALL at one time or another struggle with things, whether it be something physical we are dealing with, or something that we think we can't do. For some reason, I always think of Helen Keller when I go through this and she inspires me to know that I CAN. Thanks so much for stopping by, neighbor! Have a wonderful weekend! She was one am.a.zing woman. I love the quotes that are attributed to her. They really clarify what our priorities should be....and what we take for granted. Great posting today (although I'm very late in responding!). "They really clarify what our priorities should be....and what we take for granted." Yes, they sure do! I think of her a lot and admire her so! Much thanks for stopping by, my friend!